Come enjoy a wonderful experience of sharing time with your family and friends in our condo. We are a newly redecorated condo with large rooms to move around in, 2000 square feet of living space. Great for family gatherings, corporate meetings and ski vacations. Our 5 bedrooms will sleep the following: 1st bedroom has 1 queen, 2nd bedroom has 2 queens, the 3rd bedroom has a twin and a queen, 4th bedroom has 1 queen and the 5 bedroom has a king. We have a well equipped kitchen, with two dishwashers for large groups. Separate beverage area equipped with refrigerator with ice maker and wine cooler, coffee maker. There is storage for 12 sets of skis in the garage that maybe secured with locks. Our group of 8 (5 adults, 3 kids) spent 5 days at Copper Mountain and the condo was perfect for us. Conveniently located for the more advanced skiers and an easy shuttle ride to the Center/West Village for our beginners. Pictures of the condo are accurate and the space is very comfortable and useable for large groups. Marilyn and Jessica were always quick to respond to any questions and made us feel welcome. Thank you! This was our first time to share a condo with two other families, so we were a little nervous about all being in one unit. This Wheeler House floor plan was great, with 1 bedroom downstairs and 3 up it really eliminates noise traveling up and down. So adults could be up talking downstairs without waking up kids that were sleeping upstairs (and vice versa!). The spacious living area gave us room to spread out, and the two dishwashers in the kitchen made all the difference cleaning up after meals for 11! We'd definitely stay here again. 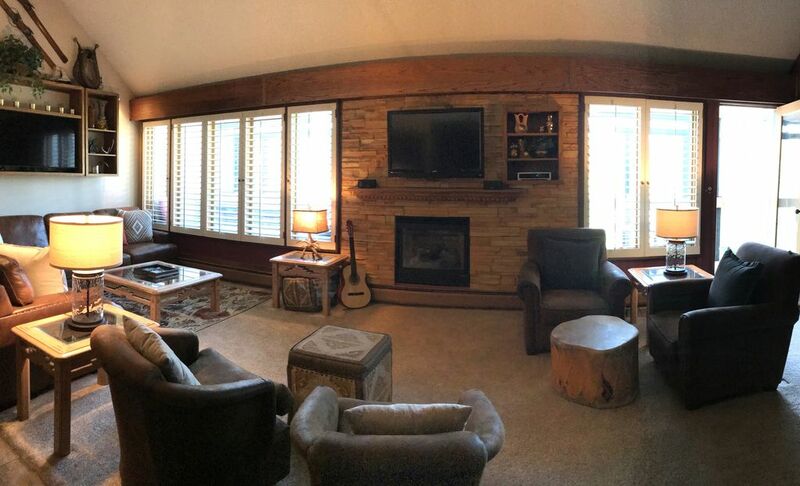 Our recent ski trip at Copper Mountain was amazing and we loved the condo. We needed something that could accommodate three families and the condo at Wheeler House did just that. The living/dining area was great for relaxing after a long ski day and closed in porch was perfect for the kids to eat and play while the adults visited inside. For more advanced skiers, Super Bee lift will get you to any runs on the mountain but may not be ski-in ski-out for beginners. And there are storage lockers and underground parking which is a plus. The condo was just as advertised. We really enjoyed our stay, and wouldn't hesitate to pick this one again. It's on the top (4th) floor of the building, no noises above you. No noises at all, really, the whole thing was well soundproofed and quiet. The bedrooms were good sized, the beds and bedding very comfy, firm mattresses, TVs in every one. The 2 shared bathrooms were smartly designed with doors between the shower/tubs and toilets and the sinks, tons of linens, plenty of shelf space for toilet kits & cosmetics. The kitchen was loaded with cooking implements, we cooked all our own breakfasts and dinners. The living and dining rooms were plenty big enough for our group of (at times) 8 people. Having an underground garage was very handy, and we were thankful for the luggage carts. You need your own padlocks to lock the ski storage bins in the garage, we just kept ours in the SUV, instead. To get to the slopes you walk across the road and then between 2 other condo buildings, short and sweet. Restaurants and a couple of ski shops were also right there, easy walking distance. Our damage deposit was returned promptly. We have nothing but good things to say about the condo. Perfect size for our grown adult children. The condo was in great condition. Very close to the superbee lift. Very relaxing. We thoroughly enjoyed our stay at this 5 bedroom condo. The kitchen is the most well equipped of anyplace where we have ever stayed. Double the dishes, double the silverware, two dishwashers, and every kitchen gadget you can imagine. This made cooking in a pleasure!!! The living room and dining room are spacious with enough seating for everyone. As a group of ten (eight adults and two children) we were very comfortable despite having to share the three bathrooms. The bedrooms and bathrooms could use a little updating but the convenience of the kitchen outweighs that and we will probably select this condo on our next trip. One note: bring your own hairdryer and be prepared to provide the some of the toiletries for your stay.